Spend less for more pages with INKvestment cartridges - the innovative and cost-effective solution for any home office. Up to 2 years of ink included with 12 Super High-yield ink cartridges‡. 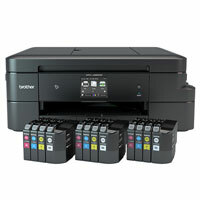 Business-capable features include automatic two-sided printing, up to 20-sheet ADF, and wireless and mobile device connectivity. Two-year limited warranty with free phone support for the life of the product. Easily navigate to powerful features with a 2.7" Touchscreen display.